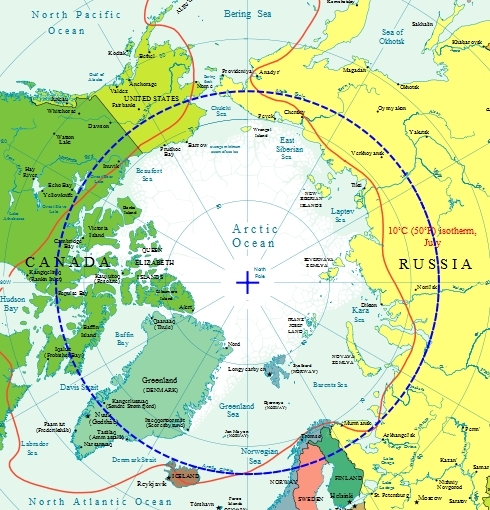 The Arctic is a highly unique area of the world, in that a number of countries that are otherwise nowhere near each other (Russia and the United States, for example) all have part of their countries extending into this region. This proximity to each other only in a specific area of the world has sparked the need for each of these countries to cooperate with one another to best make use of and protect the Arctic Circle, and here we’ll go over some of the different aspects that go into Arctic cooperation and politics. The first aspect of Arctic cooperation and politics is that there are eight primary arctic nations. These are the United States, Russia, Canada, Denmark (including Greenland and The Faroe Islands), Iceland, Sweden, Norway, and Finland. While most of the population of these countries lives below the Arctic Circle, they each have some amount of territory that stretches into it. These countries make up the members of the Arctic Council, which deals largely with environmental treaties, and not so much the addressing of boundary disputes and the allocation of resources. The policies that go into Arctic cooperation and politics differ significantly by the individual country, with each country wanting to focus on defense and sovereignty of their land, resource development of the area within the Arctic, as well as how shipping routes and environmental protection policies are addressed. The Nordic countries have a history of cooperation within the Arctic, although more countries are getting involved in this today. Other cooperative Arctic organizations include the Conference of Parliamentarians of the Arctic Region, or CPAR, and the International Maritime Organization, a shipping network established over sixty years ago. The world of Arctic cooperation and politics is also home to a number of sub groups, such as The Nordic Council, an inter-parliamentary body that is comprised of Denmark, Finland, Iceland, Norway, Sweden, and several different autonomous territories. There is also the Barents Euro-Arctic Council, which focuses on the Barents Region, and the Pacific NorthWest Economic Region Arctic Caucus, which is designed to share information and develop regional policies geared toward developing the Arctic. For the United States, policies pertaining to the Arctic include national defense, protection of the environment and wildlife of the Arctic, ensuring environmental sustainability of Arctic development, and strengthening the cooperation of the various other nations involved in the development, protection, and exploitation of natural resources within the Arctic.